Apple Inc., facing criticism over working conditions at Chinese plants of its major assembly suppliers, particularly Foxconn, said the Fair Labor Association will conduct “special voluntary audits” at Apple’s request. Apple said the first inspections, by a team of labor rights experts led by FLA president Auret van Heerden, began Monday morning at Foxconn’s Shenzhen facility. Apple said its suppliers “have pledged full cooperation with the FLA, offering unrestricted access to their operations.” The findings from the first assessments will be posted in early March. “Similar inspections will be conducted at Quanta and Pegatron facilities later this Spring, and when completed, the FLA’s assessment will cover facilities where more than 90 percent of Apple products are assembled, Apple said. Apple said in January it became the first technology company admitted to the Fair Labor Association, which conducts independent monitoring and verification to ensure that its standards are upheld in the workplace. The Fair Labor Association, founded in 1999, is a group of companies, civil society organizations and colleges and universities. It monitors factories in the supply chains of affiliated companies to assess compliance with FLA standards and requirements. The group requires participating companies to commit to allowing unannounced independent external monitoring audits and to enforce the FLA Workplace Code of Conduct in supplier facilities. Most of the more than 30 participating companies are clothing and footwear makers; its website lists a dozen “participating suppliers” which commit to implementing its standards in their facilities. The suppliers are based in China, Hong Kong, Pakistan, El Salvador, South Korea, Turkey, Sri Lanka, Vietnam, Thailand and Singapore. In addition, more than 200 colleges and universities require licensees of college logo-bearing products to participate in the FLA licensee program. According to its latest annual report, 38% of suppliers under FLA programs were in China (1,792 factories). USA suppliers ranked second at almost 8% (366 factories). 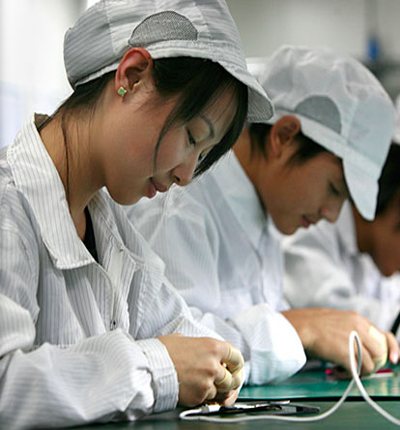 Apple’s announcement that it has asked the Fair Labor Association to conduct “special voluntary audits” of working conditions at the plants of Chinese suppliers follows a growing wave of unaccustomed adverse publicity toward the consumer electronics giant. In January, the popular radio program This American Life broadcast an account of the experiences of monologist Mike Daisey, who has been performing a one-man show “The Agony and the Ectasy of Steve Jobs,” based on his research into conditions at the Foxconn plant. And in late January, the New York Times ran a lengthy examination of working conditions at Chinese electronics manufacturers. This American Life’s web page notes that advocacy group SACOM (Students and Scholars Against Corporate Misbehavior, Hong Kong) has released three reports investigating conditions at Foxconn. Mr. Daisey has been performing his show at New York’s Public Theater. The January broadcast prompted a petition drive by activist groups Change.org and SumOfUs.org and last week the groups said they delivered more than 250,000 petition signatures to Apple seeking a working protection strategy. Today (Feb. 13) the New York Times reported that Mr. Daisey plans to release a theatrical transcript of his show, free to download and without cost for a performer to use it. After Apple’s announcement Feb. 13, Mr. Daisey posted comments on his website. PreviousHow Green Was President Obama’s State of the Union? Are Business Schools to Blame for the Financial Crisis?